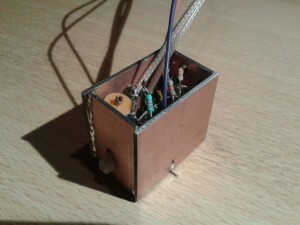 The finished VFO, just before closing the lid. Building a stable VFO is challenging. Oscillators tend to drift away due to (very small) temperature fluctuation, or due to small capacitive changes in the direct environment (e.g. the frequency changes when you move your hand towards the oscillator). The VFO used in my 30m QRP transceiver is not different from others, so I had to deal with the same issues. The VFO of this radio is a very common Clapp oscillator (which is actually a type of Colpitts oscillator). The basic oscillator is built around the BC547. The frequency is mainly determined by the LC circuit just left of this transistor. The “C” (in the LC circuit) is the sum of the capacitance of the trimmer, the BC212 varicap capacitance (depending on the TUNE dial) and the BC204 varicap capacitance (depending on the RIT dial). The RIT dial is keyed by the morse key to get a small frequency shift (normally about 600-800 kHz) when transmitting, but allows you to tune the receiver a bit when the opposite station drifts away a bit. Before inserting capacitors in the oscillator, you should test them. 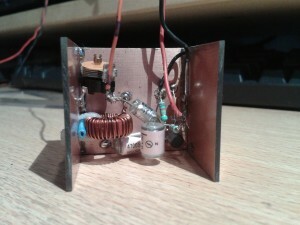 Therefore I built a small Clapp oscillator in an easily accessible setup (dead bug) using the planned components. I attached a small piece of thin wire to the output of the oscillator, powered it up and used a shortwave receiver (in SSB mode) to find the oscillator’s output frequency. Then I varied the temperature by blowing air through the oscillator (using my mouth), and by applying heat from my soldering iron. In both cases the frequency should not drift. You can easily hear this on the receiver, the tone should not change when varying the temperature. Simple Clapp Oscillator to test effects of changing temperatures on the capacitors. The orange wire acts as a simple antenna, providing enough signal to be picked up by my shortwave SSB receiver. The frequency may also change when you move your hand or a tool close to the oscillator, or when you touch the case, or squeeze the box a bit. To get rid of such effects, build the VFO in a tin box or cover it with copper clad. The VFO will provide a tuning range of about 70 kHz, which easily covers the 30m band (which is 50 kHz wide). My VFO tunes from 2.092 to 2.164 kHz. 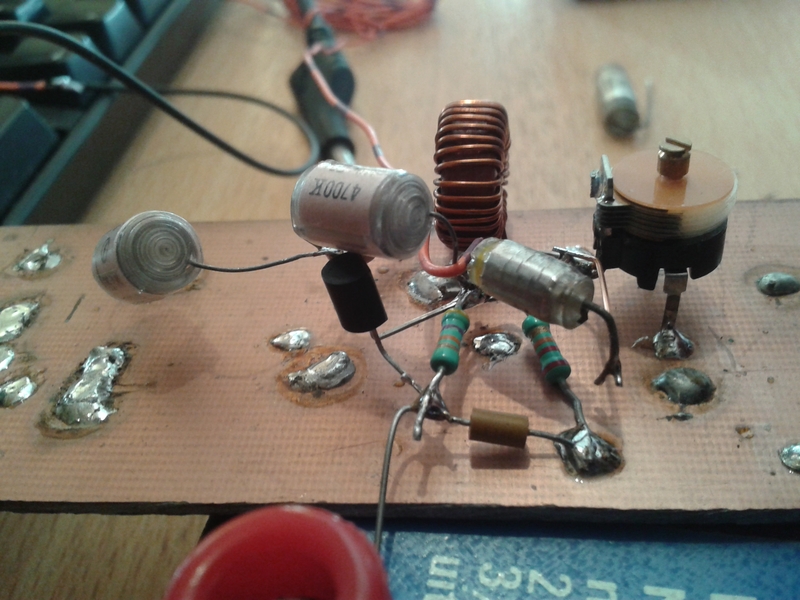 Since the VFO signal is mixed with an 8 MHz fixed oscillator, my final tuning range will be from 10.092 to 10.164 kHz. Adjust the 90pF trimmer to cover the complete band. Initially my VFO was a bit too low in frequency, so I removed one turn from the coil. Be sure to measure the coil’s inductance before putting it in the VFO, I needed a few extra turns on my T50-2 core to get the 4.7 uH. The LC-circuit is the heart of the oscillator, and therefore mounted first. The basic oscillator is running. Now I can add the varicap circuits. 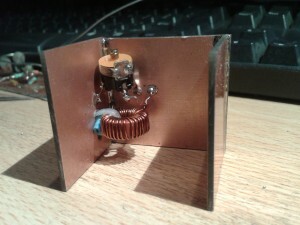 The VFO is closed now, all sides are covered with copper clad, except the top to allow connections. If you want an excellent almost drift free LC oscillator, I would use a Vackar or Seiler oscillator. I’ve used both of these circuits successfully with little problems. I highly recommend building with MPF102 FETs.